Sometimes I don’t want to do things “the hard way” – I just need a testing environment. Kubernetes is one of those things when I’m developing applications. So when I needed a development cluster for my newest app, I wanted something fast, easy and without a lot of dependencies. Luckily, the latest releases of Kubernetes has made great strides in reducing the time between wanting a Kubernetes cluster and actually using a Kubernetes cluster – If you are on a public cloud, not OpenStack. So I fired up my code editor and created a quick way to deploy simple Kubernetes clusters with terraform and kubeadm. This post provides the instructions and bootstrap scripts to create a Kubernetes development cluster on an OpenStack cloud with minimal dependencies (you will only needs to install terraform, this repo and kubectl on your laptop) to get a fully functional cluster running. At the end of the process, you should see a network environment like this in your OpenStack Horizon dashboard. There are some limitations to this. Most notably, it is not highly available and requires Ubuntu 16.04 as an operating systems (althought kubeadm supports other OSes). You can read about the other limitations of kubeadm here. To start this process, you’ll need some software on your Mac (yes, I said Mac. I’ve tailored to this here. It will work on other platforms, but there might be some minor differences). I usually install most of my software with Homebrew. Once we have the requisite tools installed, we need to pull down the terra-kubeadm-on-os github repository. You can also do this by git clone https://github.com/slashk/terra-kubeadm-on-os/ if you would like. Next, we need to configure the scripts for our OpenStack cloud. You’ll need to login to your OpenStack Horizon dashboard as we’ll need to lookup information in our account. To accomplish this, we need to tell Terraform a few details about our OpenStack cloud. The terraform.tfvars file uses a simple variable = "value" format where you can customize it for your OpenStack cloud and preferences. 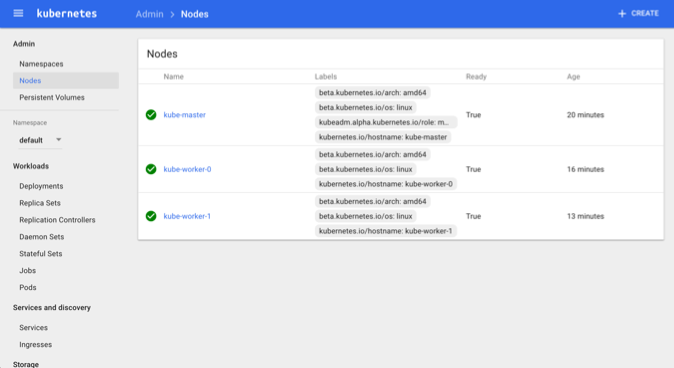 As you can see, I’ve setup this to cluster for 1 master, 2 worker nodes running Kubernetes version 1.5.2 on nodes sized with the kube-master flavor (that I specially created in my OpenStack cloud). With your configuration set, you just need to kick this off. I usually do a terraform plan and give it a quick sanity test before letting it rip with a terraform apply. … And wait. On my cloud, it takes about 5-7 minutes to complete (mostly updating packages). Apply complete! Resources: 10 added, 0 changed, 0 destroyed. 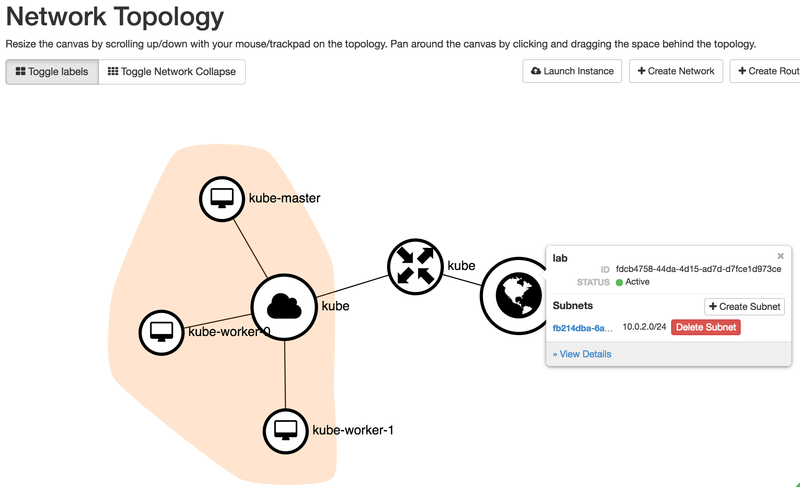 You can continue to experiment with the kubectl tool to examine and manipulate your cluster. 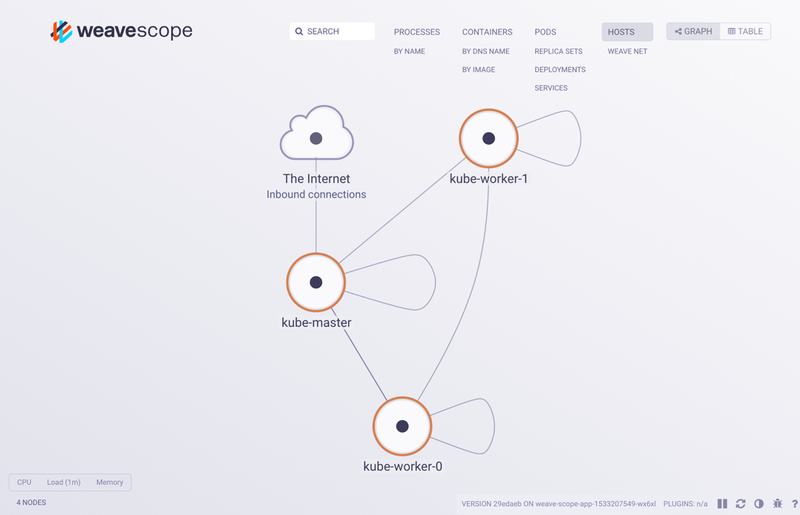 Two GUI management tools have also been installed on the cluster for you: Kubernetes Dashboard and Weave Scope. You an access either over a tunnel to your Kubernetes control plane with the aliases you just installed. Then navigate your browser to http://localhost:9090/ and you should see the dashboard. Then navigate your browser to http://localhost:4040/ and you should see your new cluster layout. To launch some actual applications on your new cluster, follow the “socks shop” example in the Kubernetes docs at Installing a sample application . To clean up your entire cluster (i.e. delete everything you just created), use the terraform destroy command. Destroy complete! Resources: 10 destroyed. Everything that has been created should now be gone (subnet, routers and all). If you get an error, try running the terraform destroy command again.